Take a good look at this poster for an upcoming movie starring Meryl Streep and Amy Adams. What do you think the title of the flick is? 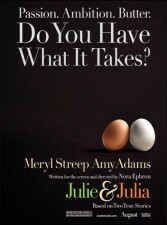 If I hadn’t known better, I would guess: “Do You Have What It Takes?” Wrong-o: It’s “Julie and Julia,” which is buried at the poster’s bottom. This is the picture (release date: August 7) with Streep as Julia Child and Adams as the fan (whom Child didn’t love unequivocally, to say the least) who made all 524 recipes in “Mastering The Art of French Cooking.” I hope the movie turns out to be better than the poster. Can Anything Stop Meryl Streep?